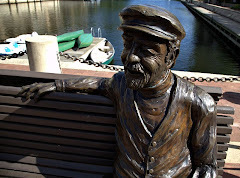 Restonian: News blog from Reston, Virginia, the mauve-colored New Town (tm): Village Centers? We Don't Need (As Many) Stinking Village Centers! Village Centers? We Don't Need (As Many) Stinking Village Centers! Reston founder Bob Simon, for one, says Reston could have fewer village centers. When Reston was planned in the early 1960s, supermarkets were about 15,000 square feet, he said. Today, they are more than 100,000 square feet. Which, if you've walked by Tall Oaks Stucco Wasteland Shopping Center lately, sort of makes sense. Not even the undeniable allure of "Susie de los Santos" was enough to support yet another grocery store in our fair community. At the same time, though, if it (or another one of the Village Centers) was to be redeveloped into the usual bollardy goodness, it would be a mistake -- almost criminal even -- if developers were allowed to do so without maintaining some sort of public space and ground-floor retail. As far as neighborhood redevelopment, Hudgins said “99 percent of what is here is what it is.” However, it is not impossible for neighborhoods to be part of a redevelopment proposal if 75 percent of owners petitioned in favor of it. ARCH’s contention is that so much of the success of not only Reston’s past development and high standards of design but also of our recent Reston Master Plan Special Study effort is directly attributable to processes established whereby RESTON residents, RESTON community leaders, and RESTON developers and stakeholders have been charged with the responsibility and authority to CREATE, OVERSEE, and APPROVE the vision, standards and goals necessary to support past and future planning, development and growth. ARCH believes that similar entities, processes and authorities should also be true for the future development and growth of those areas relevant to Phase II of the Reston Master Plan Special Study. Our opinion is that the goal for future Village Center development should be the establishment of a vision that ensures the future financial viability of each and creates environments that excite people to come together to establish and sustain long-term relationships, and to form that special sense of community so essential and characteristic to Reston’s past development and character. With regard to the Village Centers, one size doesn’t fit all. One center may require more residential; another retail or commercial development, and another the creation of open space to achieve the vision. Maybe they should fill out a form or something. Photos courtesy of Confidential Restonian Operative "Joel." Can we just get a Wegmans and tear everything else down. I think the 75% number approving redevelopment of a cluster could be legally challenged. A constitutional amendment was recently passed in Virginia that says the county can't seize private property for private development. Even RA's attorney Ken Chadwick said 100% have to sign off on a sale to a developer. And then there is the issue of the cluster common lands. RA has rights over those. To all of you of who keep complaining about "over-development" and increased density, whining "This isn't the quiet little community I've always enjoyed since the 70's, what would Bob Simon think yaddah yaddah".... Do you realize that the current population is at least 58,000 and yet Bob Simon's ultimate plan was intended for a population of 80,000? Quit complaining. Growth is Reston is absolutely necessary if it is going to succeed. And yes, that means an increase in assessments to accommodate for that growth. What utter nonsense. Reston already "succeeds" by any standard. All you want is for increased population density and traffic (no, the Silver Line isn't going to solve that problem) and have the residents subsidize private development and the public facilities required to sustain it. But you can relax, Anonymous, as the fix is in--you'll get what you want apparently--with no public input into the process. "Quit complaining" is a lazy attempt to quell debate. Much of the debate centers not on the population numbers, but on the new reality that the residents and owners have had little say (and now with Phase 2 virtually zero say) in the next steps, while forces external to Reston (the county and the developers, for those who need it spelled out) hold all the cards. With this reality becoming clearer, the "no growth is smart growth" crowd may seem reactionary, but they are a rational response as observers of a system without checks and balances. RA is a pet dog, reticent to bite its master, and the citizens' groups are humored but have no stick to wield. As for sentimentally looking back at the "ultimate plan" for Reston, one would hope that part of his plan was also some degree of self-determination, be it in the form of a town or other structure. Certainly, the vision we have seen for much greater density without corresponding recreation and park land exposes the disconnect between what is appropriate growth and what is developer ecstasy. And with regard to those rising assessments, much of the new density may not come with the RA annual pricetag, as they are often outside the HOA, yet the new residents will want to use the trails and parks that RA members fund. Again, this is symptomatic of a people lacking a voice through RA, citizens' groups, or the county. Using simple high school economics, that density coming into Reston with full RA membership would translate to lower assessment dues per capita, not higher. Hey, if we're getting rid of Town Centers, why not turn Tall Oaks into a park? We could put a skateboard park in there, or move the dog park there, or even put in a BMX pit. If Reston needs more green space for the coming unwashed masses, I can't think of a better place to start. Or swimming pools. Or tennis courts.